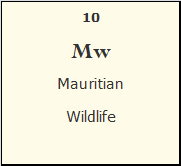 The Mauritian Wildlife Foundation (MWF) is the only NGO to be totally dedicated about everything relating to plant and animals. The MWF carries on site projects in Mauritius, islets, rodrigues and works closely with both local and international partners. The aim of the MWF is to recreate the the ecosystem we used to have, to preserve it and accentuate its propagation once again. The MWF also aims to preserve species who are on the verge of becoming extinct. As such the role of the NGO is pivotal. Mauritius Yellow Pages once stabilised will make it a point to contribute both in financial terms and time to help MYW to create awareness and help them in their task through an educational program.